Science Live! explores the wild world of science in interactive shows guaranteed to wow audiences of all ages. Though captivating experiments and audience participation, Science Live! creates a one of a kind learning experience! Science Live! shows may be reserved as part of a field trip to DHDC (45-minute show) or travel to your campus for on-site performance (60-minute show). To reserve a Science Live! 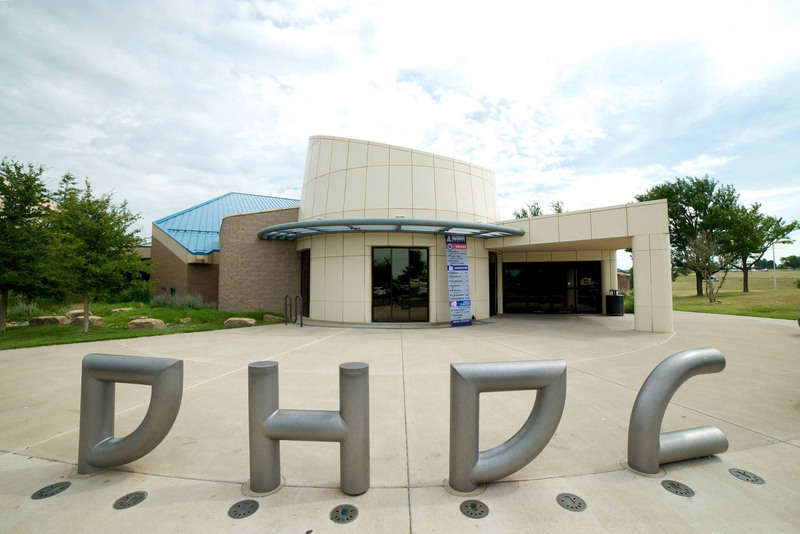 show as part of your visit to DHDC, please use the Field Trip Reservation Form. To reserve an on-campus show, use the form below. For shows at DHDC, seating capacity is 90 students per show. DHDC reserves the right to book multiple school groups for a reserved Science Live! show time if space permits. For on-campus shows, logistic requirements and audience size limits apply to select shows. Please review show requirements (as noted in show descriptions below) prior to booking. CAREERS IN SCIENCE – NEW! What does it take to be a scientist? What does a scientist do? Find the answers to these questions and more as the DHDC staff explore careers in science. This shorter Science Live! show is great for career days of all ages. Delve into engineering, physics, chemistry and more with hands-on demonstrations that may literally knock your socks off. Access to water before performance. Access to electricity during performance. Explore the how, why and WOW! of chemical reactions in this amazing program. Audiences will discover how chemical reactions create giant pools of never-ending foam, molten metals and other explosive creations! Students will dive into chemistry like never before when they watch our chemical concoctions create some astonishing results! Access to a sink after performance. Meet the DHDC’s smallest residents in this interactive program. Students will have the opportunity to get up-close with the DHDC critters which include snakes; lizards; tarantulas; and small mammals, like sugar gliders or even a chinchilla! Concepts explored in Critters Live! include life cycles; habitats; differences within species; and learned vs. inherited traits. For the safety and well-being of our animals, Critters Live! is limited to an audience of 100 students per program, and on-campus programs are limited to one show per day. Travel is limited to schools within 60 miles of Amarillo. Oxygen, fuel and an ignition source. That’s all you need for this spine-tingling Science Live! From coffee creamer fireballs to barking dog rocket reactions, KABOOM! explores the science of combustion with demonstrations that will leave your students cheering for more. Requires a large room with a high ceiling, such as a gym or cafeteria. Science Below Zero examines some of the chilliest science on the planet. Students will discover the physical changes which occur when solids, liquids and gases are exposed to the extreme cold of liquid nitrogen. Audiences will be amazed as we use liquid nitrogen to power the DHDC Music Machine for the grand finale! Requires a large room with a ceiling at least 8 ft. high. Cannot be performed outdoors when temperatures are above 90 degrees. Magician’s secrets revealed! For years magicians have relied on scientific principles for their most amazing illusions. Students will witness tricks such as fire eating and the bed of nails and uncover the science behind the magic. Sciencepalooza features the zaniest experiments in the Science Live! collection and explores a variety of science concepts. With a brand new series of demonstrations (eddy current guillotine, anyone?) exploring everything from optical illusions to materials science, every presentation provides an unparalleled science adventure! StarLab brings the DHDC Space Theater to your campus! This fully enclosed portable planetarium projects a full dome, current view of the Panhandle night sky. Similar to the Astronomy Live! Space Theater program, students in the Starlab will examine major stars and constellations and discover the mythologies surrounding their origin. StarLab can fit a maximum of 30 students per presentation. Multiple presentations may be reserved for larger groups. Everything in our Universe moves and interacts, and forces play a major role in that movement. With giant cannons, a hovercraft and other crazy demonstrations, Unseen Forces investigates the relationship between force and motion and explains how these unseen forces are at work in our daily lives. The atmospheric elements that combine to create weather work largely unseen. Weather Wonders uncovers these elements through dynamic demonstrations which examine the conditions necessary to create clouds, precipitation, lightning, thunder, tornadoes and other weather phenomena.